DataSpace provide secure offsite Document Storage and Records Management services. We understand that every business and organisation has different Document Storage requirements and this is why we provide tailor made packages of our services for each individual client. 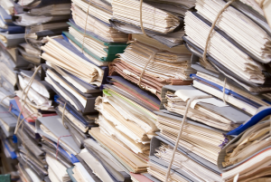 Whether it is Document Storage, our Scanning services (scan on demand or bulk scanning), our Secure Destruction services or the use of our secure online web portal FileLive we are able to mix and match these to suit your requirements. We can offer a package price for a mixture of services for smaller companies. Whether you have 5 archive boxes that require storage for 20 years and not to be accessed or 100 active boxes that have different retention dates, which might require retrieving and scanning or retrieving and physically being returned to you. We are happy to go through all of our services to find the best plan for your requirements in the most cost effective manner for you. We can also provide you with a Service Level Agreement, that will contain your specific requirements including time frames and what exactly is expected from us. This will enable you to be fully confident in the service we provide to you. DataSpace will manage your account with complete integrity and confidentiality. We aim to be the best within our industry and are proud to provide a quality and efficient service to our clients. With DataSpace you can rest assured that your documents are stored in a purpose built, BS5454 and BS27001 accredited facility, and are also in line with PCI DSS and CQC regulations. There are no hidden service charges or fees with DataSpace, we provide all details of any charges you might receive with our services.